Gas Solenoid Valves are as versatile as they are useful. Translating electrical impulses, to open and close the valve, they control the flow of gas in a wide range of industrial and residential applications. In this tutorial article, PIF takes a closer look at what Gas Solenoid Valves do, what applications they're used for, and the key manufacturers of these handy types of solenoid valve. What are Gas Solenoid Valves? Gas Solenoid Valves are made of parts that receive electrical impulses that then translate those impulses into mechanical movements. 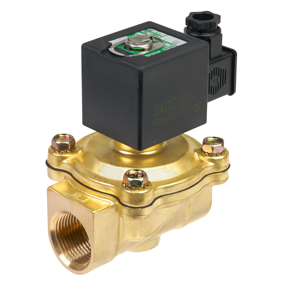 When an electrical impulse is received, by the Gas Solenoid Valve, it will open or close the valve. Thus controlling the flow of gas into a chamber or through a line. Residential applications include solenoid valves used inside furnaces. These control when the gas comes on and is ignited by the pilot light to create warmth. Vehicles powered by natural gas use solenoid valves to control the flow of gas into the engine’s cylinders. While gas-powered clothes dryers also have solenoid valves to control the flow of gas into the dryer, which helps to prevent fires or gas poisoning. ASCO provides the broadest line of solenoid & motorised shutoff valves designed to control the flow of fuel gas, liquid propane and all grades of fuel oil used in combustion applications such as: industrial furnaces, ovens, kilns, incinerators, burners and boilers. Solenoid operated valves handling combustion system pilot and main line fuel shutoff and control needs. These valves are available in 2-way normally closed, normally open, manual reset, and 3-way diversion. Bürkert also produce solenoid valves for fluid and gaseous media, aggressive or neutral, applicable in various ranges of temperature and pressure. In fact, Christian Bürkert, founder of Bürkert is said to have pioneered the ‘solenoid valve’ as we know it today, setting the international benchmark for industrial solenoid valves. Buschjost (an IMI Norgren brand) manufactures a wide range of Solenoid Valves for use with different pressures, media’s, temperatures and applications. The Buschjost range of Solenoid Valves include direct-acting solenoid valves, indirect-acting solenoid valves, or a combination of both; solenoid valves with forced lifting. ASCO valves are available in brass, aluminium, and stainless steel. Their main features include junction box; pipe taps; visual indication; proof of closure; leading agency approvals; and pipe connections from 1/8” to 3”. Most valves are rated for -40ºF service for outdoor installation in frigid climates. Bürkert’s range of gas solenoid valves are available in an extensive range of body and seal materials. From PTFE, to NBR, EPDM and even PEEK, this tutorial article on solenoid valve materials by Solenoid Valve expert Michael Hannig will tell you all you need to know. This chemical resistance chart and solenoid valve selection guide from Bürkert is an extremely useful resource when specifying or choosing the correct solenoid valve for an application. This white paper from ASCO covers breakthrough solenoid valve technology in oil and gas applications. Finally, this technical tips video from Norgren Buschjost explain exactly how solenoid valves work in process applications, the different types of solenoid valves available and typical applications.